Research - Holly L. Lutz, Ph. D.
This project seeks to improve our knowledge of the relationships between bats and their bacterial and fungal symbionts, as well as how these symbiont communities can shape or influence eukaryotic and viral pathogens. Initial sampling for this work has focused primarily in the East African countries of Uganda and Kenya, transecting a broad range of ecosystems and habitat types. These samples provide baseline data for a large number of bat species with diverse life histories, and are allowing us to examine the effects of anthropogenic disturbance and unnatural habitat selection on chiropteran symbionts - including parasites, and pathogens. In addition to exploring the diversity of symbionts in African bats, we are utilizing chiropteran cell lines and germ-free mouse models to explore how microbes influence the immune response of bats to viral pathogens. ​View a preprint of our recent work on BioRxiv. This project is in conjunction with the Field Museum of Natural History, the University of Chicago, and Argonne National Laboratory, with Jack Gilbert and Bruce Patterson. Malaria parasites affect nearly all terrestrial vertebrates, and their impact on vertebrate hosts ranges from mild to severe, in some cases leading to extinction of entire species. Advances in molecular methods have revealed an astonishing degree of diversity among malaria parasites and closely-related haemosporidia, and host switching has occurred frequently throughout their evolutionary history. Without an accurate account of parasite diversity, we may only guess at the evolutionary history underlying current relationships. Exploration of novel parasite diversity is therefore a large component of my research. Since 2009, I have collected data for genetic and morphological analyses of haemosporidian parasites in birds, small mammals, and reptiles. My research has focused primarily in the east African tropics, but has included Neotropical parasites as well. Samples included in my research are collected as part of a larger effort led by the Field Museum of Natural History to survey biodiversity, including parasites and pathogens, of birds and mammals. I use phylogenetic and comparative genomic approaches to resolve evolutionary relationships between malaria parasites of birds and mammals, and to explore the factors leading to diversification and host switching in haemosporidian parasites. Listed below are a few of my current projects. Haemoproteus, or Leucocytozoon. To study the relationship between host traits and probability of haemosporidian infection, colleagues and I examined a broad range of bird species from 16 avian orders in Northern Malawi, discovering over 200 new parasite lineages in the process. This study is the first to test such associations in Afrotropical birds. This work is in collaboration with the Cornell Lab of Ornithology, Field Museum of Natural History, and University of North Dakota. View this work in ﻿PLoS ONE﻿. To identify and describe malaria parasite diversity, I have sequenced the mitochondrial cytochrome b gene. While useful for differentiation between parasite lineages (see MalAvi database), this marker does not provide sufficient data for resolution of relationships between most lineages of avian malaria (Plasmodium and Haemoproteus). I am therefore collecting additional data from nuclear and apicoplast genomes to improve phylogentic resolution for a diverse assemblage of malaria parasites I have identified in east African vertebrates. View this work in Molecular Phylogenetics and Evolution. Among the many African mammals I have tested, bats have proven to be consistent hosts of haemosporidian parasites - most of which represent new genetic lineages, and possibly new species. I am collecting additional genetic data to examine their phylogenetic placement with respect to avian Plasmodium and haemosporidia of other mammalian taxa. View more work on Kenyan bats. (A-C) Hepatocystis cf. 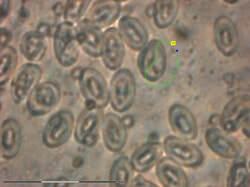 epomophori macrogametocytes ex. Epomops franquetti; (D-E) Polychromophilus melanipherus microgametocytes and (F) macrogametocyte ex. Miniopterus natalensis; (G-H) Nycteria sp. microgametocyte, (I) macrogametocyte, and (J) gametocyte ex. Hipposideros cyclops. Currently there are few publicly available genomes of Plasmodium parasites, with no representation of avian Plasmodium species. My colleagues and I have used laser capture microdissection microscopy (LCMM) methods to obtain parasite isolates from birds for genomic sequencing and comparative analyses. We have demonstrated that LCMM, paired with whole genome amplification methods, is a viable option for obtaining genomic material for comparative genomic analyses and the development of phylogenetic markers. View this work in Parasitology Research. Lutz, H. L., Ramírez-Puebla T., Abbo L., Durand A., Schlundt C., Sjaarda A. K., Gottel N., Hanlon R. T., Gilbert J. A., Mark Welch J. L. In Review. A simple microbiome in the European common Cuttlefish, Sepia officinalis. Lutz, H. L., Jackson E. W., Webala, P. W., Babyesiza, W. S., Kerbis Peterhans, J. C., Demos, T. C., Patterson, B. D., Gilbert, J. A. In Review. Ecology outweighs evolutionary history in shaping the bat microbiome. Song, S. J., Sanders, J., Delsuc, F., Metcalf, J. Amato, K., Taylor, M. W., Mazel, F., Lutz, H. L., Winker, K., Graves, G. R., Humphrey, G., Gilbert, J. A., Hackett, S. J., White, K. P., Skeen, H. R., Kurtis, S. M., Withrow, J., Braile, T., Miller, M., McCracken, K., Maley, J., Blanton, J. M., McKenzie, V. J., Knight, R. In Review. Comparative analyses of vertebrate gut microbiomes reveal convergence between birds and bats. Barrow, L.N., McNew, S.M., Mitchell, N., Galen, S.C., Lutz, H.L., Skeen, H., Valqui, T., Weckstein, J.D., Witt, C.C. In Press. Deeply conserved susceptibility in a multi-host, multi-parasite system. Ecology Letters. Lutz, H. L., Carryl, S., Santymire, R. M. 2019. Wildlife Microbial Genomics and Endocrinology. In D. Marco (editor). Microbial Ecology: Current advances from genomics, metagenomics, and other “omics” approaches. Horizon/Caister Academic Press, Poole, UK. Lutz, H. L., Tkach, V. T., Weckstein, J. D. 2017. Methods for Specimen-based Studies of Avian Symbionts. Pp. 157-183 in M. S. Webster (editor). The Extended Specimen: Emerging Frontiers in Collections-based Ornithological Research. Studies in Avian Biology (no. 50). CRC Press, Boca Raton, FL. Lutz, H. L., Marra, N. J., Grewe, F., Carlson, J., Palinauskas, V. Valkiūnas, G., Stanhope, M. J. 2016. Laser capture microdissection microscopy and next generation genome sequencing of the avian malaria parasite, Plasmodium relictum. Parasitology Reseach, doi:10.1007/s00436-016-5237-5.